This species is accepted, and its native range is N. Chile. Perennial; caespitose; clumped densely. Culms geniculately ascending; 15-40 cm long. Leaf-sheaths tubular for much of their length; with 1 of their length closed; as wide as blade at the collar; retrorsely scabrous; pubescent; with reflexed hairs. Leaf-sheath oral hairs ciliate. Ligule an eciliate membrane; 0.3 mm long; erose. Leaf-blades 2-10 cm long; 1.5-2.5 mm wide. Leaf-blade surface pubescent; hairy on both sides. Leaf-blade apex acute. Inflorescence a panicle. Panicle open; linear; secund; 6-10 cm long. Primary panicle branches appressed; simple. Panicle axis dominant; pilose. Spikelets solitary. Fertile spikelets pedicelled. Pedicels filiform; curved; ciliate; hairy all along. Spikelets comprising 2 fertile florets; with diminished florets at the apex. Spikelets elliptic; laterally compressed; 6-10 mm long; falling entire. Floret callus pubescent. 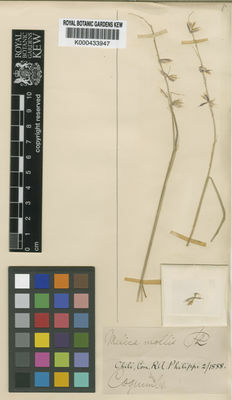 Glumes dissimilar; with lower wider than upper; shorter than spikelet; thinner than fertile lemma. Lower glume ovate; 5-8 mm long; 0.9 length of upper glume; membranous; much thinner above; much thinner on margins; without keels; 3-5 -veined. Lower glume primary vein falling short of apex. Lower glume surface asperulous; puberulous; hairy below. Lower glume apex erose; obtuse. Upper glume ovate; 8-10 mm long; 0.8 length of adjacent fertile lemma; membranous; much thinner above; with hyaline margins; without keels; 5 -veined. Upper glume surface asperulous; puberulous; hairy below. Upper glume apex dentate; 2 -fid. Fertile lemma lanceolate; 6-8 mm long; 2-3 mm wide; chartaceous; much thinner above; much thinner on margins; mid-green, or purple; without keel; 11 -veined. Lemma surface puberulous. Lemma apex dentate; 2 -fid; obtuse. Palea 2 -veined. Palea keels ciliolate; adorned above; with 0.5 of their length adorned. Palea surface puberulous; hairy above. Apical sterile florets barren; in a clump; elliptic; 2.5-3.5 mm long. Apical sterile lemmas obtuse. Lodicules 2; united; oblong; 0.2 mm long; fleshy; truncate. Anthers 3; 1-1.5 mm long. Caryopsis with adherent pericarp; dark brown. Embryo 0.33 length of caryopsis. Hilum linear; 1 length of caryopsis.